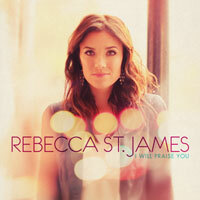 Rebecca St. James has released her first studio project since 2005. This cd is entitled "I Will Praise You" and is a collection of worship songs that she says is "her most personal recording to date." This album contains 10 songs -- including five that were co-written by Rebecca as well as two cover songs that were influential in Rebecca's own spiritual walk. The cd insert shows that each song has a verse from the Bible that it references. The verses are found throughout the Old and New Testaments, in Psalms and even in the book of Revelations. Rebecca says: "The overall theme of this album is trust and surrender and just focusing on God -- which I think is really the purpose of worship ... to set our eyes on Him and glorify Him." What a great reminder that "worship" is not a style of music, but a state of our hearts. I'll walk in Your light. Check Out: Rebecca's Listening Party to preview I Will Praise You. You can also visit Rebecca's Website for more information. Buy It: You can order I Will Praise You online or purchase it at your local Christian bookstore. Leave a separate comment for each entry. Please leave your e-mail in this format: sowingdandelionseeds(at)yahoo(dot)ca if it isn't public in your profile. All entries will be verified. Tell me a favourite song that has been an inspiration in your life. One song that has been extremely inspirational to me is "Lifesong"...reminds me to always be a light and example to others! I am a new follower via GFC! "You are my Hope" by Skillet is just a beautiful song and has inspired me to do many things! I follow Rebecca StJames on twitter! I liked your "Have a blessed Easter" post with the Jesus figurine speaking to the multitudes (of fisher price people)! Fantastic! One song that has been very inspirational to me in the past year or so is God Of This City! New public blog follower. Matt S.
Like Rebecca St. James on Facebook! I will praise you in this storm by casting crowns has helped me through a lot. I like like Sowing Dandelion Seeds on fb. taam216(at)gmail(dot)com. Amazing Grace! I love that song!